Some women undergoing fertility treatments may experience OHSS. This abnormality of the ovary is treatable with early detection and knowing what signs and symptoms to watch for. Ovarian Hyperstimulation Syndrome (OHSS) is an adverse reaction to the introduction of high levels of Human Chorionic Gonadotropin. HCG is the hormone normally produced during pregnancy and is often used in fertility drugs and treatments. The use of HCG helps to stimulate mature follicles to release eggs. In some cases, this introduction of HCG causes blood vessels in the ovaries to be overstimulated and leak fluid into the ovary. 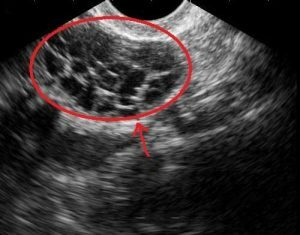 As more fluid accumulates, the ovary becomes swollen and inflamed. In severe cases, fluid may begin to leak into the abdomen. As more fluid fills the abdominal area, other organs can become adversely affected. Between 1-2% of all women who undergo fertility treatments, especially injectable hormone medications, will experience some degree of OHSS. These treatments are common among women undergoing in vitro fertilization, ovulation induction, or intrauterine insemination. Women under 30, women with PCOS, and women with a large number of follicles are particularly at risk. Those with low body weight are also more likely to experience these complications. Patients with any of these risk factors should notify their doctor immediately if they notice any symptoms of OHSS. OHSS can cause several short term and long term effects. Understanding these symptoms will help patients know when to contact their physician for the earliest intervention. The primary symptom of OHSS is swollen and painful ovaries. The area around the ovaries will become tender to the touch, and the patient will experience ongoing discomfort. Other symptoms include nausea, diarrhea, bloating, and rapid weight gain. Mild cases may experience up to a 6.6 pound weight gain within 5-10 days. In moderate to severe cases, severe abdominal pain may be present as well as severe nausea and shortness of breath. Due to the collection of fluid in the abdomen, patients may gain up to 33-44 pounds within 5-10 days. Many patients experience blood clots in the legs and dehydration leading to decreased urination. If left untreated, OHSS can cause serious long term effects. Electrolyte abnormalities and chronic dehydration may lead to kidney failure and in rare cases, death. OHSS can also cause complications such as torsion or twisting of the ovaries, as well as the rupture of ovarian cysts. In the event of a pregnancy while experiencing OHSS, the patient is at an increased risk of miscarriage. Most cases of OHSS are mild and symptoms subside within a week. All cases must be monitored closely in case intervention is needed. Patients should weigh themselves twice a day to watch for any sudden weight gain, and keep track of urination. Sudden dramatic changes in weight or decreased urination should be reported to a physician immediately. Doctors will perform physical exams and vaginal ultrasounds to monitor the ovaries for swelling and fluid filled pockets. Blood tests will be performed to make sure the kidneys are functioning properly. Compression stockings should also be worn to prevent blood clots in the legs. In severe cases, it may become necessary to drain the excess fluid from the ovaries or abdomen. This is done by inserting a needle into the area and drawing the fluid out. Physicians may also administer Gonadotropin Releasing Hormone (Gn-Rh) to suppress ovarian activity if the patient does not improve within a week or their condition worsens. If ovarian cysts begin to rupture, or if other organs such as the liver become damaged, surgery may be required. Patients who experience or suspect they are experiencing OHSS should refrain from sexual activity and heavy lifting, and seek advice from their physician immediately. Often times, a menstrual period will help to lessen the effects of OHSS, while a pregnancy will prolong and exaggerate symptoms. The vast majority of cases are very mild and resolve on their own without hormone intervention, but closely monitoring one’s symptoms is crucially important to avoid long term adverse effects. While OHSS is not a guaranteed side effect of fertility treatments, knowing the symptoms can prepare you for any adverse effects procedures may cause and allow for quick diagnosis and treatment.